Before this trip I had always thought about landmines at an academic and intellectual level. I knew that Cambodia had a tragic history with landmines that their people were continuing to pay for on a daily basis and I heartily believed in the equation: LANDMINES = BAD. But I didn't get it, really get it at a visceral level, until this trip. My eyes were opened by a one-two-three punch of events. The first was meeting Lynn Bradach. I've already mentioned Lynn in the group post (and you can read more about her here), but in brief, her son Travis was killed in Iraq while clearing mines, and in his memory she has made fighting landmines and the terrible damage they do one of her life missions. "First she persuaded a dozen people to raise money to get rid of land mines in former war zones by running a marathon together. 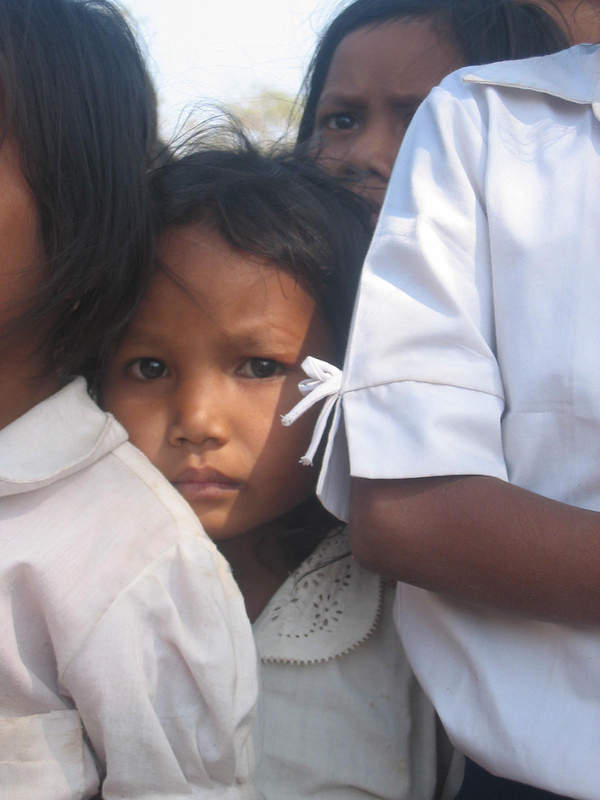 Then she took the more than $30,000 they raised and invested it in the children of Sakream Tbong, Cambodia, who walk through a minefield each day on their way to school. And then she traveled there to present the gift in person. She left behind notebooks and pens for the kids, and a plaque dedicated to the memory of her son, Marine Cpl. Travis Bradach-Nall. The memorial will stand by the flagpole of a new school being built by a Japanese aid group. Before the school can be built, the mines must be cleared, and Bradach's gift will make that happen." That was a year ago. Now Lynn and two of her siblings (the gentle giant James and irrepressible Katie) were back to see the fruits of her efforts and attend a dedication of the memorial. We were privileged enough to be invited along. This trip was the second element of the visceral recognition. When we arrived we found 300 children in school uniforms lined up like honor guards along the path from the road to the new flagpole that incorporates a memorial to Travis. As Lynn and Sokhon (who led the mine clearing efforts), followed by James and Katie, walked down the honor path, all 300 kids started clapping. It was an incredibly moving moment to see the children clapping for and thanking this woman who had made such a difference in their daily lives . The moment then turned incredibly uncomfortable when the organizers called for the other people in the group to walk down the center of the path too. The rest of us didn't have anything to do with the fields being cleared, weren't related to Travis, and in fact had never had the opportunity to meet him. And though at least John had led the trip the year before when Lynn came out to make the commitment and Andrew had guided them then, Brian and I had just met them the night before. We were all just kind of there for support for Lynn and to see the school and field for ourselves and be inspired. We felt very much like a fraud walking down between the clapping children since we hadn't actually contributed anything to the effort. But we each put a flower on the memorial for Travis and added our thoughts of thanks for what his mom is doing in his memory and our prayer for an end to landmines and an end to the killing in Iraq. The final eyeopener was a visit to Aki Ra's landmine museum in Siem Reap. (pictures for this paragraph to come later.) You can read his full life story here, but basically Aki Ra was a child soldier conscripted by the Khmer Rouge who set many landmines in uniform. Now that peace has come to the country he has dedicated his life to trying to make his country safer and improving the life of land mine victims. To that end he regularly goes out on mine clearing trips on his own using none of the technology or equipment that protects the official mine clearers and he has taken in a number of children who have lost limbs to landmines in other villages and provided them with a home and a chance to go to school. He has created a somewhat strange but compelling museum/exhibit area with all sorts of defused explosives and information about them and their victims. After being out at the school with Lynn (and seeing the ubiquitous landmine victims begging all over town) the experience walking around the small compound, looking at all the mines and ordinances scattered around, checking out the model minefield, watching the documentary on his efforts and reading all the life stories of his kids were the final pieces to bring it all home to me. I'm not exactly sure how I am going to put this deeper understanding of the evils of landmines to use, other than obviously supporting anti-landmine initiatives. As we get settled back into regular life after our return, I'm hoping to find a way to incorporate action on a number of issues that have become important to me during the trip. Who knows, maybe someday I'll be able to help a group of children the way that Lynn has done. Each of us doing our little part to act, instead of just talk. That's how things change. -- Other cool parts of the visit out to the village with Lynn and co. was distributing the notebooks and pens that she had donated to the children and teachers and watching how happy they were with these items, and checking out the kids learning in their new classrooms. Since they don't have textbooks, the teacher writes everything on the board and they copy it all down into their notebooks.